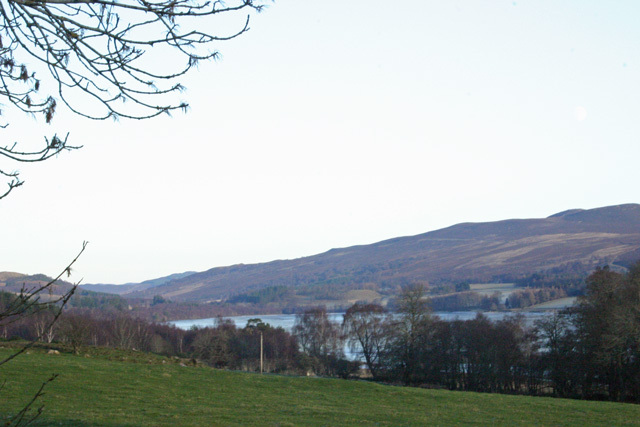 A large self catering holiday cottage with panoramic loch and mountain views. Gate House self catering accommodation, a former farmhouse, is blessed with panoramic views over Loch Mhor in the long and narrow strath of Stratherrick and the Monadhliath mountains. Stratherrick runs parallel to Loch Ness but several hundred feet higher in altitude and closer to the wilderness country of the Monadhliath mountains with room to wander at your leisure amongst wild crags and heather covered moors, resplendent in summer in their purple haze of bloom or covered like icing with dazzling winter snows. This is a breathtakingly beautiful location for a holiday where peaceful forests, hills and lochs dominate. With plentiful wildlife, dramatic as the scenery, herds of red deer wander the hillsides, and many a buzzard will be seen wheeling effortlessly above the cottage, scanning the wild country below. Osprey fish in the loch before you in the summer months and hundreds of wild geese populate the loch shores during the winter. If you want to feel part of this, the wildness of Scotland, even for a few days, then a stay at The Gate House will help you experience it all. The cottage is large, ideally suited for larger family holidays and groups of friends where you will each have plenty of space to relax and do your own thing if you want to. The cottage is situated at Lyne of Gorthleck, just a small scattering of cottages on the western shore of Loch Mhor, only a ten minute drive to the quiet shoreline of Loch Ness, where you will find picnic sites and lochside walks on the stretch of road between Inverfarigaig and Dores. Inverness is 20 miles distance with plenty of supermarkets, varied shops, theatre, swimming pool and many other visitor attractions. Fort Augustus lies 15 miles in the opposite direction, a charming village centred on the locks of the Caledonian Canal, with a good choice of eating places and interesting heritage centres and shops. There’s plenty of scope here for restful relaxation, watching the river craft plying their way through the locks of the Caledonian Canal. The west coast and the Isle of Skye and Inverewe gardens are only about 90 minutes drive away – a great day out. Eating out, there is lots of choice in Inverness and a couple of local places here, The Whitebridge Hotel is a short drive from the house and serves excellent food. The hotel bar and restaurant is open to non residents. There are also a couple of hotel bars and restaurants at Foyers (5 miles) and at Dores (10 miles), including the popular Dores Inn. 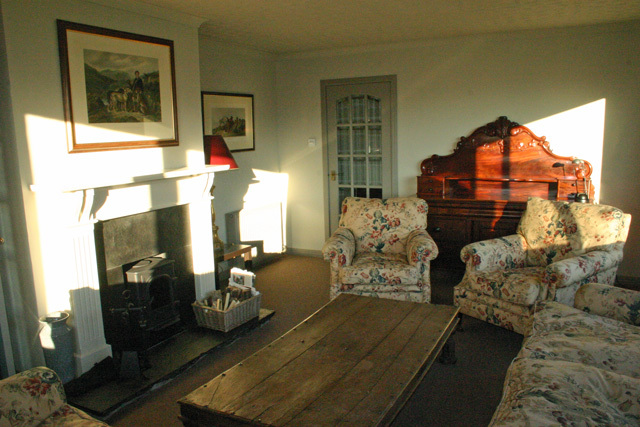 Spacious lounge with log fire (woodburner) and the large picture windows give fantastic views. The modern fully fitted kitchen has an electric hob and oven, microwave, dishwasher and fridge-freezer, plus all necessary kitchenware. 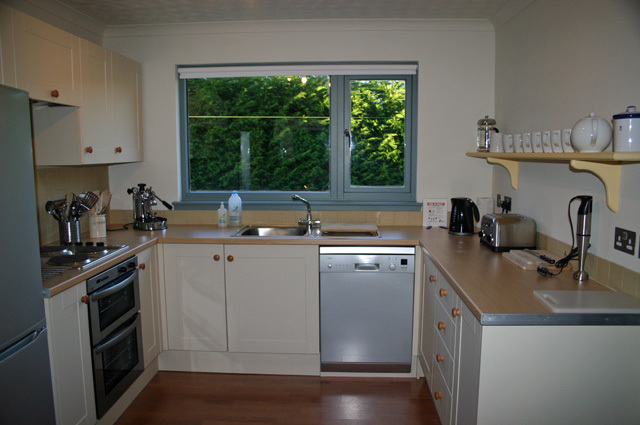 Utility room with washing machine, tumble dryer, ironing facilities and vacuum cleaner etc. 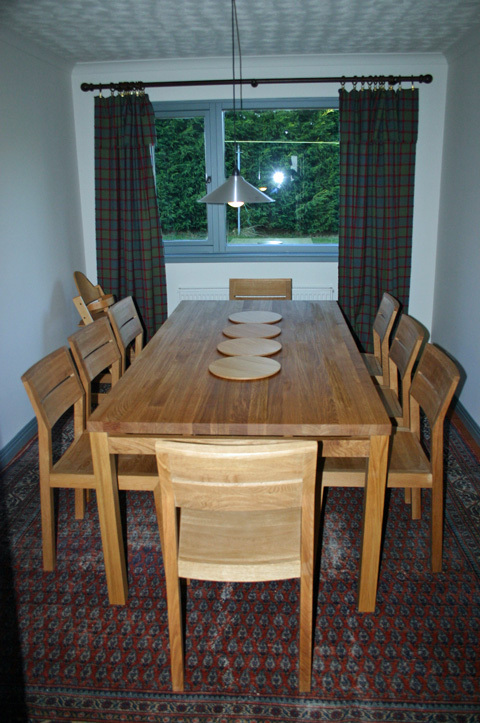 Separate dining room to seat up to 10 people. Telephone in the entrance hall. Study with wireless internet access, hi fi system and lots of reading material. Cosy TV lounge, with flat screen TV, Sky package and DVD player. 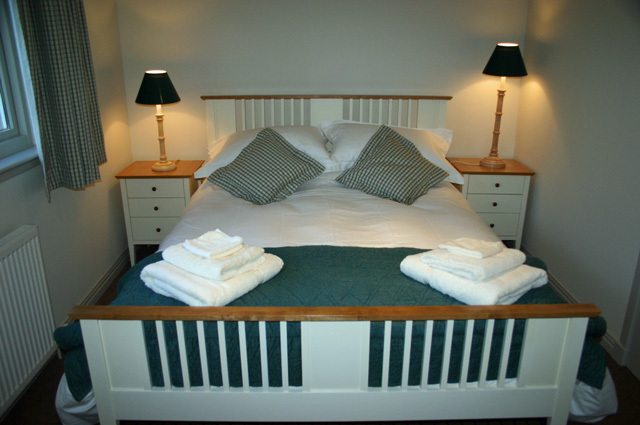 Two double bedrooms downstairs, one with an ensuite shower room, heated towel rail. Separate large shower, with toilet and hand basin. King size bedroom with views over the Loch from the window seat. Telephone. 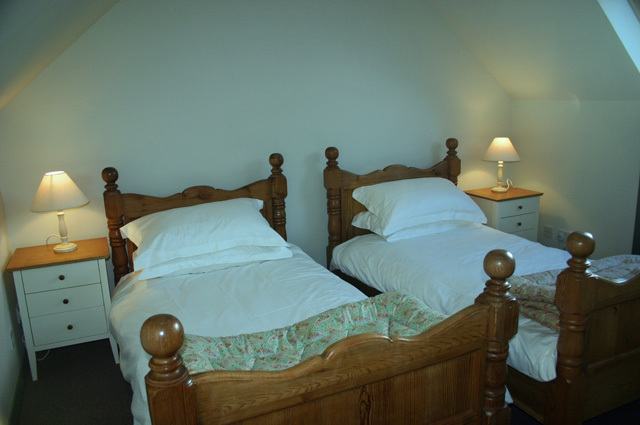 Two twin bedrooms with views over the loch. Bathroom with bath, toilet and handbasin. Oil-fired central heating and double glazing throughout. One very well behaved dog will be allowed. Dogs are not allowed into the lounge or bedrooms. Please note that the garden area is unfenced. 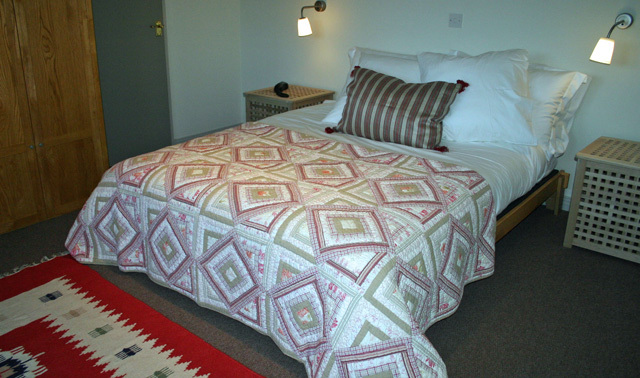 All the beds will be made up for your arrival with quality bedlinen. A hand and bath towel will be available for each person. Electricity, oil, fuel for the fire. Absolutely outstanding house, beautiful surroundings and warm. We were all lucky this week as the weather was beautiful, apart from one morning, but that didn't matter. Plenty to do locally and further away, and nice and quiet at this time of the year too! We had a lovely holiday. 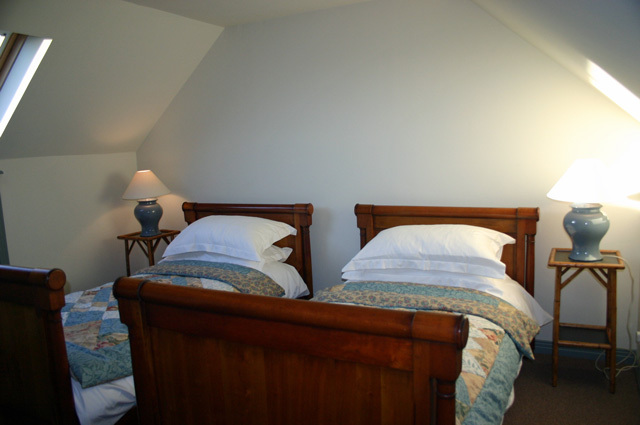 The Gatehouse is spacious and well equipped. The oven, although electric, is very efficient and much better than mine at home. The fridge freezer is a good size. We even found that sainsburys delivered which was a huge help. Lovely cottage in a fantastic setting,really enjoyed the views of loch mhor.was a good base to explore loch ness and many other places of interest,with Culloden battlefield probably my favorite,stopped for a week ,could have stopped a lot longer,great cottage,great holiday! Perfect place, lovely cottage, we had a fabulous holiday! We will return for sure! We recommend it to our friends too! Thank u! Fabulous place. My family, friends and I stayed at the Gate House for a long weekend when I was taking part in the Loch Ness Marathon. 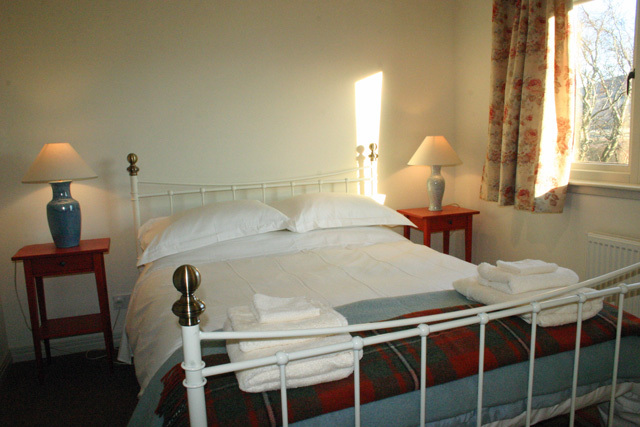 Wilderness Cottages were really helpful in helping me find somewhere initially and the booking was flawless. We were all pleasantly surprised on arrival as it is a lot bigger than you think. It was very well equipped and comfortable. 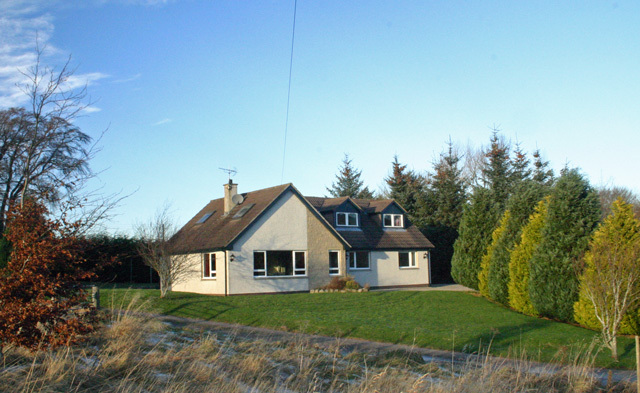 Fantastic, quiet location with great views & Inverness/Fort Augustus a short drive away. I would recommend and definately return. A group of us made Gate House our home last week and had a fantastic time! Lots to do in the surrounding area and the facilities were of a very high standard, with the blessing of a dish washer too! Great value, would definately return again. stayed at this lovely house in April 2008 although it snowed for most of the week it was very warm and very comfortable,we really relaxed with my son and duaghter -in-law and all our grandchildren,the house is very spacious and has loads of room for everyone,we will definitely be back.